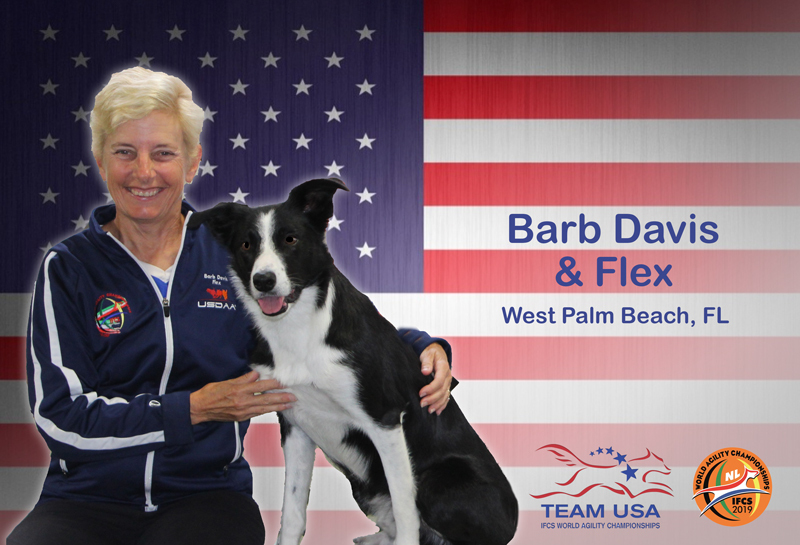 Barb and her 8-year-old border collie, Flex, are proud to represent Team USA at the 2019 IFCS World Championships. Flex and Barb bring a wealth of experience to the team, having won both 24" Steeplechase and Masters Challenge Biathlon at the 2018 Cynosport World Games. Barb’s career achievements also include three additional USDAA Grand Prix wins in 1999, 2002, and 2010. “I am looking forward to representing the USA and USDAA at this World Championship, with my special dog Flex. It means sooooo much to be able to compete in the beautiful Netherlands with this amazing partner of mine with a big heart. We are hoping to bring the USA home a medal and hope many of my teammates do as well! Go TEAM USA! !” IFCS Team USA is generously supported by donations to the United States Association of Cynological Sports. Become a team supporter today! Congratulations to all of our team members who will represent the United States at the 2019 IFCS World Agility Championships (WAC). Former WAC Gold Medalist and 2018 Assistant Coach Andy Mueller will be returning as the head coach. Helping Andy will be Assistant Coach Jessica Ajoux, Team Manager Diann Gastley, Assistant Team Manager Heather Reinkmeyer, Fundraising Coordinator Michele Reinkemeyer, Travel Coordinator Courtney Keys, and Massage Ken Bain.